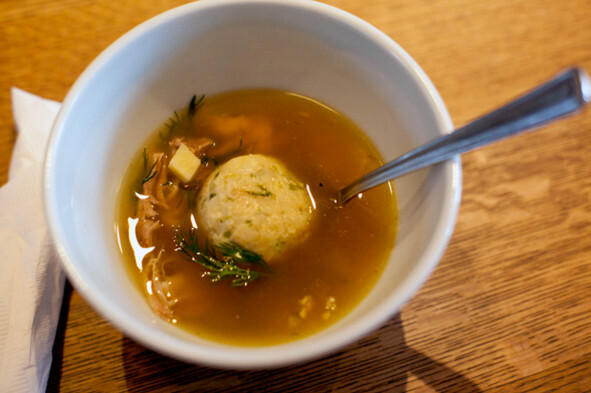 Chicken soup in Toronto is often served with fluffy matzah balls. These piping hot bowls of savoury goodness are sure to cure whatever ails you (don't quote me on that). Whether you're feeling under the weather or just need a quick pick-me-up, comforting soup is always a good idea. Here are my picks for the top chicken soup in Toronto. 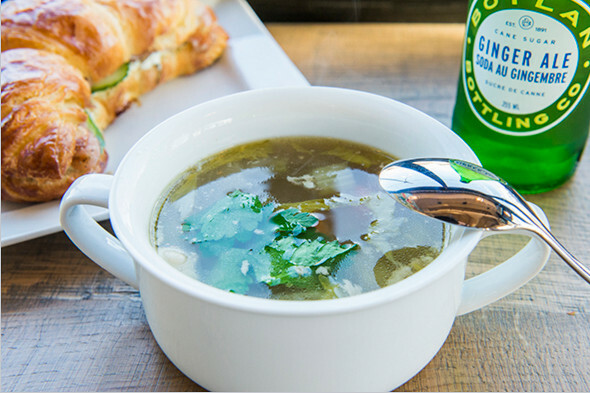 While Caplansky's may be well-known for its Montreal smoked meat sandwiches, you can also find soup on its menu. At this College Street delicatessen, each steaming hot bowl of homemade chicken broth comes topped with a matzah ball. It may not be traditional, but Ravi Soups's chicken hot pot is magical. The spicy, coconut-milk infused broth comes loaded with a variety of sweet and savoury ingredients including bok choy, edamame and mango. People's Eatery showcases Toronto's multiculturalism via its diverse menu. At lunch, you can dine on matzah ball soup, a nod to when the nearby Kensington Market was a predominately Jewish enclave. At Sid's Deli near OCAD U, the broth-to-matzah-ball ratio is about equal. Yes, Sid's serves up one massive matzah ball in its chicken soup, which also includes chunks of carrots, celery and of course, chicken. Owner Barry Muskovitch uses his grandmother's recipe for The Shmooz's chicken soup. So naturally, it appears on the cafe's chalkboard menu under the moniker "Bubbie's Chicken Soup," meaning you can head to Pape Avenue if you're in desperate need of some Jewish penicillin. Located just north of Toronto, in the fair suburb of Thornhill, Centre Street Deli is famous for its Montreal smoked meat. But if you're looking to veer away from deli sandwiches, try the "boiled chicken-in-a-pot," an enormous meal that takes chicken soup to the next level. This fast and casual lunch spot at Yonge and St. Clair features a menu dominated by healthy soups, sandwiches and salads. So, it's no surprise that you can find a "Detox Chicken & Veg Soup" here. It's unclear what this soup detoxifies, but each bowl comes filled with homemade chicken broth, roasted chicken, gluten-free noodles and a slew of vegetables. If you're looking for comfort food, Free Times Cafe has you covered with items such as latkes, blintzes, burgers, nachos and, of course, matzah ball soup named after owner Judy Perly's mother, Bella. Anthony Rose's eponymous Rose and Sons Diner serves up matzah ball soup with lots of dill, as per tradition. This bowl also comes filled with root vegetables and lokshen, or egg noodles. If you're on the east side, you can head to Murgatroid for a cup or bowl of chicken soup. This Cabbagetown eatery uses locally-sourced and sustainable ingredients in all of its dishes. What did I miss? Add your suggestions for chicken soup in the comments. Lead photo of Sid's Deli by Jesse Milns. Photo of The Shmooz by Hector Vasquez. Photo of Rose and Sons by Libby Roach.